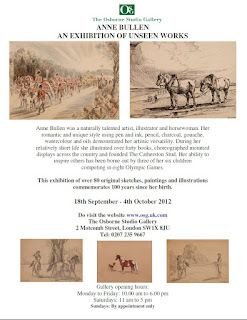 Here I am, fresh-ish from the Anne Bullen exhibition, on what what was a thoroughly horsy Sunday. After rocking up late to the British Museum (train late) to meet my friends, we whirred round the Horse exhibition, which finishes on the 30th September: the Museum are obviously keen to divest themselves of their horsey merchandise before then. Much of it is on special offer. 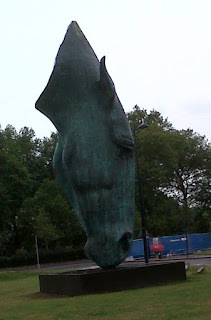 We then trekked off to St John's, Hyde Park, for Horseman's Sunday where those London horses and riders who can get there gather for their horses to be blessed. 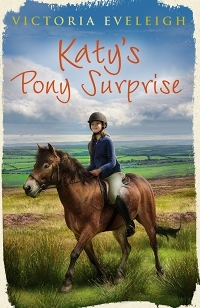 Katy's Pony Surprise originally appeared as Katy's Exmoor Friends. This edition has been re-written and updated, and it loses none of the freshness of the original. So, it will be afternoon walks from now on, until there's no light for that either. It's pink! It sparkles! It must be a pony book! The 1990s and early years of the 2000s saw many pony books leave behind the realistic covers of the 1950s and 1960s. A substantial proportion of those aimed at the younger reader were badged with pink and sparkles, and winsome straplines. Peter Clover's 1990s Sheltie series was a rare example of a series that succeeded through charm, not sparkles. 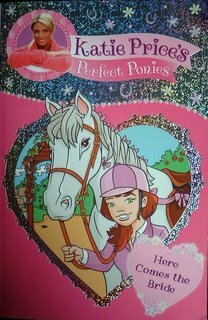 “Could you,” asks the front covers of Sue Bentley’s Magic Ponies series, “be a little pony’s special friend?” Princess of pink, Katie Price, who first hit fame as the glamour model Jordan, has written (with a ghostwriter) the Perfect Ponies series (2007-2010). Emblazoned in pink and silver, it is about a group of four friends and their adventures at a riding school. and geese. I could hear them flying in long before I could see them. They're way too far away for me to get them without trespassing thoroughly. Last year I had to wade through them, there were so many. Get there quickly. It's not on long. For ease, all the photos are on my Facebook Page.You can look at it without being a member, and the easiest way to order is to contact me there. If you email me separately, or via here, I will do my best to co-ordinate with what's going on on the Facebook page, but can't guarantee it. The pony book has often nodded towards what was going on in the children’s book genre as a whole; adventure in the 1950s, realism in the 1970s, and from the 1990s, fantasy. In 1997, J K Rowling’s Harry Potter and the Philosopher’s Stone was published. It was an astounding success, and spawned a host of fantasy-themed children's literature. 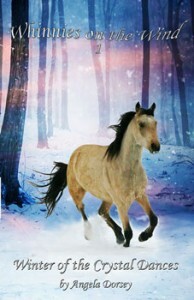 The pony book, an essentially practical genre, is not perhaps the most natural of allies for fantasy, but this did not stop publishers eager to jump on the bandwagon. Pony author after pony author leaped, with sometimes miserable results, into the fantastic. Thank you to the author for sending me copies of these books. I have to admit I'm not struck by the name of this series, but if you aren't either, don't let that put you off. These are cracking reads. They're located in the Canadian north, where Evy lives with her mother. They live a life of almost total isolation, occasionally seeing their neighbours, who live a ride away, and who have a daughter, Kestrel, who is Evy's friend: in fact her only friend, as school is something that happens remotely . And they occasionally see Evy's mother's agent (she's a painter) and that's it. They live in a cabin, and life is, by urban standards, primitive. Quite why the family live such a cut off existence is the major unanswered question of the series. Early morning light in the churchyard, and through the church porch windows. Dogs are wondering why I am faffing about sweeping the front steps instead of letting them in. I never sweep the front steps. I just swear at the gravel that jams itself under the gate and carry on. I am sweeping the steps because the house is on the market, and I have read all that stuff about first impressions. Disapproval of pony books by critics of children's fiction may have had an impact on the British market, but it certainly didn't in America. British librarians tended to view pony fiction as elitist and outmoded: American librarians saw it as a way of hooking in readers. Terri A Wear wrote Horse Stories, an Annotated Bibliography in 1987 specially for American librarians wondering which horse books to recommend to their horse mad readers.